This is the first painting I remember that froze me in place. It’s the piece that caused me to paint the way I do. 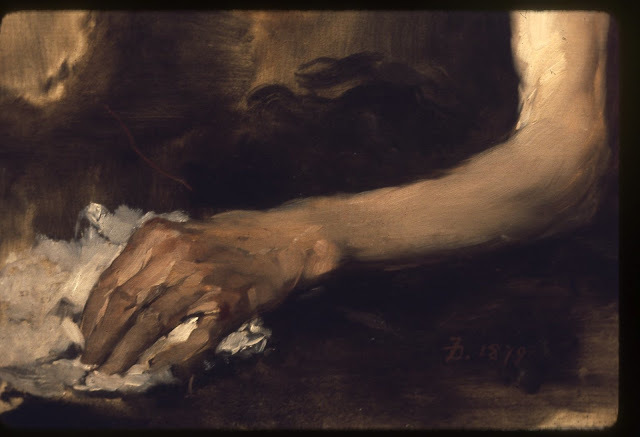 One of Frank Duveneck’s many fabulous studies, a preparation for some of the more rendered pieces made during his career. He was a virtuoso with the brush, only thirty-one when he painted it. This face dwells in my head whenever I hold the brush, whenever I lay down the paint, guiding my efforts by reminding me to stay loose and keep details to the essential elements and values. I’m taken by the deep shadows, and how he’s worked back up from there to the lights, the value range remaining quite close. 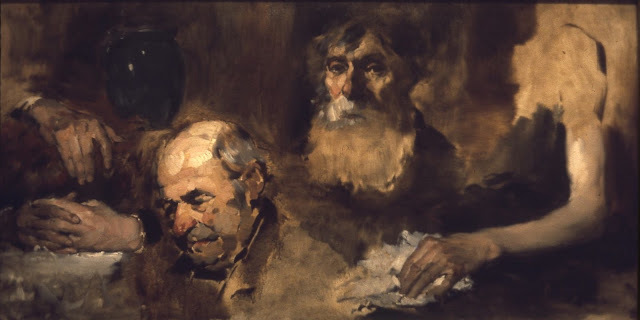 Duveneck mixed his colors quickly and confidently, most likely not creating piles of pigment ahead of time, but rather mixing on the fly. The drawing is incorporated by shape and value, giving the face the structure it needs by defining the planes. 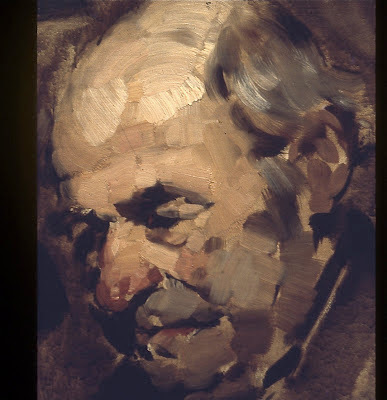 Notice the ear; even the underpainting stands in for shapes, by contrasting the middle values. The forearm stays alive by rendering the subtle values across the muscle, leading up to the bicep where the lighter paint captures the light, and subtle flesh folds. The rougher flesh of the fingers gets chiseled strokes, the thin planes of skin grabbing light between the index and middle finger. 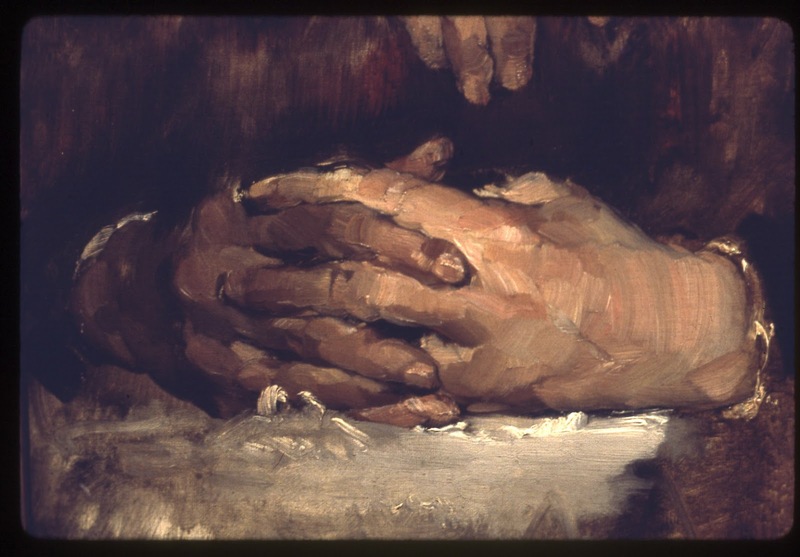 The laced fingers here establish a phenomenal range of color value that runs from the nearly imperceptible shadow side, to the few bold strokes of flesh near the knuckles. The wrist is a superb example of brighter colors against muddy colors--ahem--allowing the wrist to just barely make it into the light. For those students studying how to paint volume, look no further than these hands for learning to cut strokes across the form, not along it. 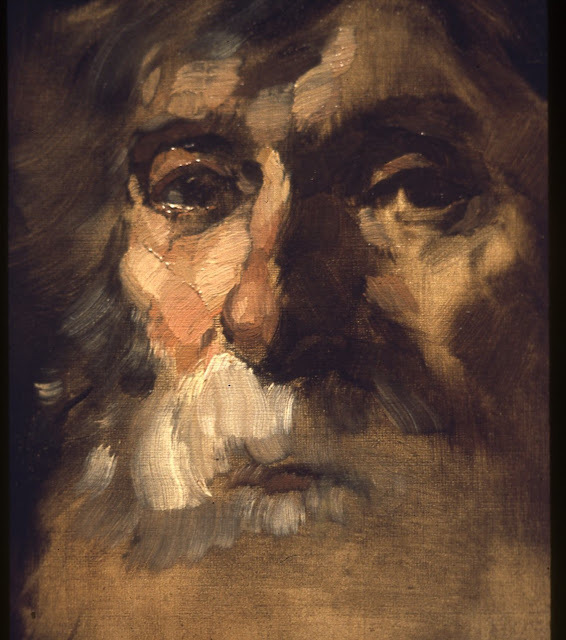 The older man’s head study is gorgeous. Minimalism at it’s very core. Unfinished and yet providing everything we need to know. It is modern art at this point, exposing the essence of painting that others, in later years, would strive to exemplify in wild passages of sensation. What some would wail about for attention, Duveneck captured honestly, in reality. When you look close enough, this painting embodies decades of advanced levels of abstract art.